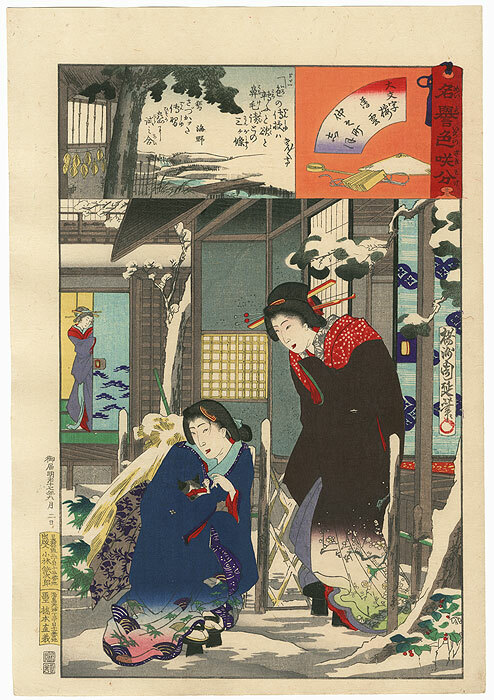 Collection Note from Bill: I was excited to purchase this beautiful print in Japan recently as part of a fine, pristine Chikanobu collection sourced from a Japanese collector in the countryside. The prints are all beautifully printed, retain 100% of their original color, are not backed, and were stored in perfect condition. 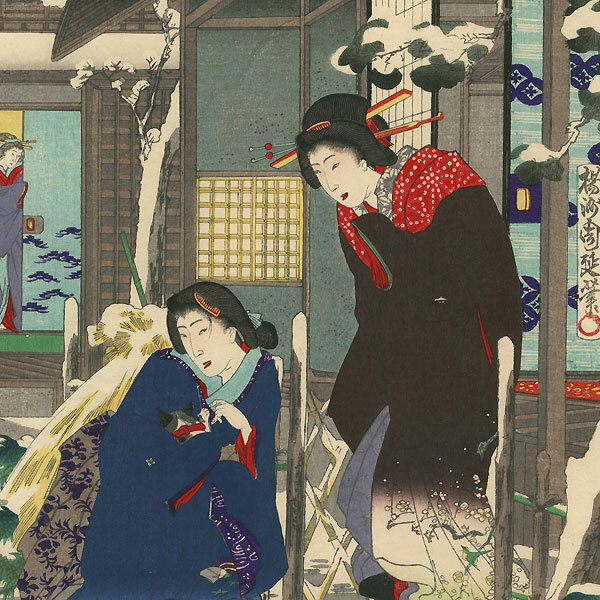 They’re a nice opportunity to collect flawless prints from this rarely seen Chikanobu series. Praise for Multi-colored Blossoms - Chikanobu's lovely series "Praise for Multi-colored Blossoms" presents portraits of famous geisha and courtesans from various teahouses. 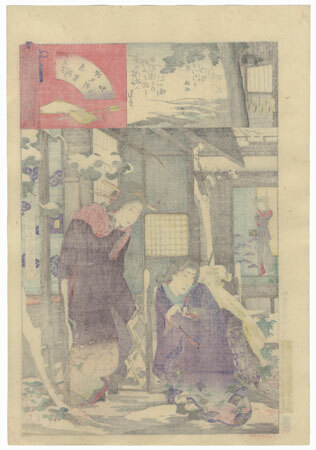 The "multi-colored blossoms" of the title refers to the women, who are shown relaxing in their spare time, enjoying gardens, arriving or leaving, or taking part in seasonal and daily activities. The settings and elegant fabrics are beautifully detailed and vibrantly colored. A band across the top features a scene with a fan-shaped inset at right identifying the subject along with a large rectangular scene. An attractive and seldom seen Chikanobu beauties series. Condition - This print with excellent color and detail as shown. Please see photos for details. Excellent condition overall.